Prott Blog - Interaction Map Feature Officially Launches! Interaction Map Feature Officially Launches! If after the 2-week trial you realize that it’s a feature that you can’t work without, upgrade your account by going to the settings icon and hitting Upgrade as the Interaction Map feature is available exclusively to Pro, Team, and Enterprise plan users. If you are new to Prott and are wondering what this is all about, the Interaction Map feature generates diagrams of all your screen interactions with a simple click of a button. This feature is useful whenever you need to get your team and clients on the same page with the vision of the project or to help them understand the different flows. It comes in handy as the changes are reflected immediately and can be shared by sharing an exported PDF or PNG files. Below are five new additions and updates that we'd like to share with you. Keep on reading! We know we’ve all been there before. You make an edit to realize a second later that’s not what you wanted to do and you feel stuck because you can’t reverse it. Now, there’s no need to worry as you can simply retrace your steps by clicking the Undo and Redo icons. Note: Please remember that if you decide to click the Reset to default button, followed by Undo, it will not take you back to the last edit that you made but will reset it back to the original setting. To undo and redo, click on the undo and redo icons located on the top panel next to the project name. We also made it possible to switch directly to the comment, hotspot and wireframe modes. 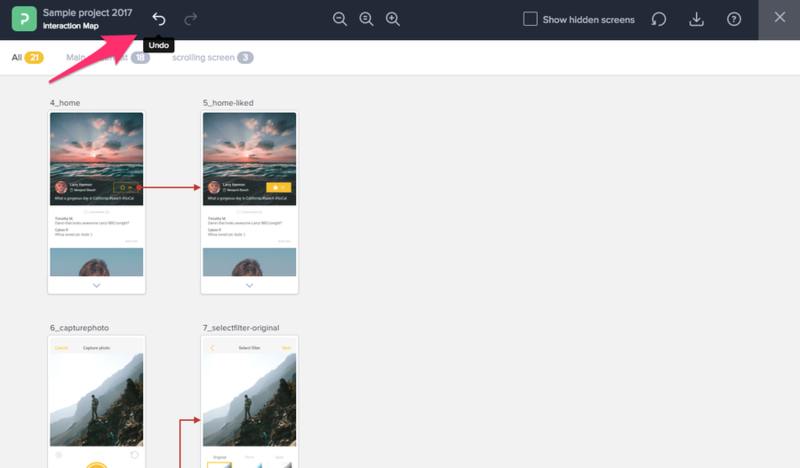 This means you no longer need to exit your interaction map but instead you will automatically be redirected to the respective edit modes, giving you a smoother workflow. To access the three modes, hover over your screen for the three icons to appear below the screen. Click on the icon to go directly to the respective mode to begin editing or commenting. From the left, edit hotspots, add comments, edit wireframes. 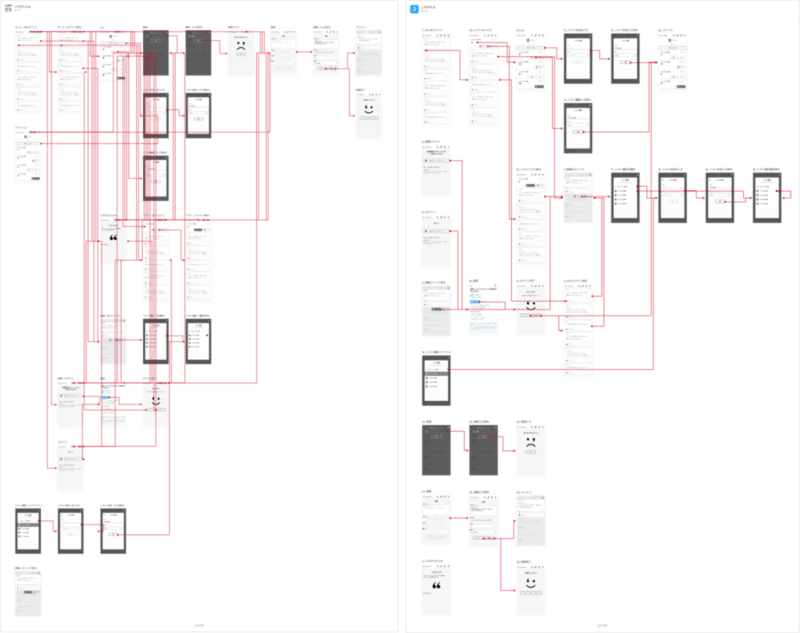 When you include screens that are longer than others, it can make it challenging to view your interaction map clearly. We made it possible to expand and collapse long screens. With this flexibility, you can now control which long screens to leave expanded and which ones to collapse. To collapse a screen, from the footer of the screen, click the up arrow. To expand the screen, click the down arrow. There’s that saying that goes, “out of sight, out of mind” and we feel this couldn’t be any truer for situations when you want to hide irrelevant screens from your map. To hide a screen, simply hover over the label of your screen and hit Hide screen. To bring back the screens you’ve hidden, check the Show hidden screens box. 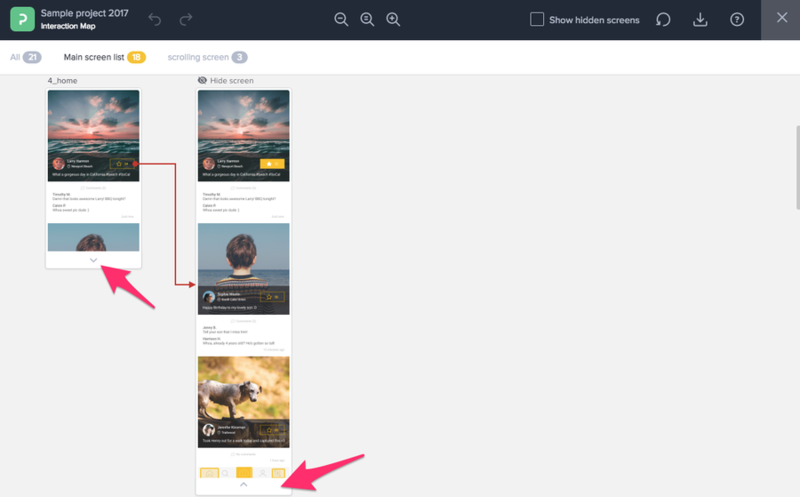 The interaction map on the left includes hotspots from the header and footer and the map on the right is after the hotspots from the header and footer have been hidden by default. All hotspots located near the header and footer will be hidden by default. To view the hotspots that have been hidden, hover over the hotspot and gently click the highlighted area for the hotspot to appear. To find out more on how to use the Interaction Map feature, check out our awesome help page here. If you have any questions or comments about the Interaction Map feature, feel free to reach out to us at anytime on chat or via email.